If you’re on the hunt for a fun Spring activity for your children, take a look at our Cereal Rainbow Craft! Made with fruity cereal, your little ones will love making this colorful craft! My kids LOVE to craft with food! 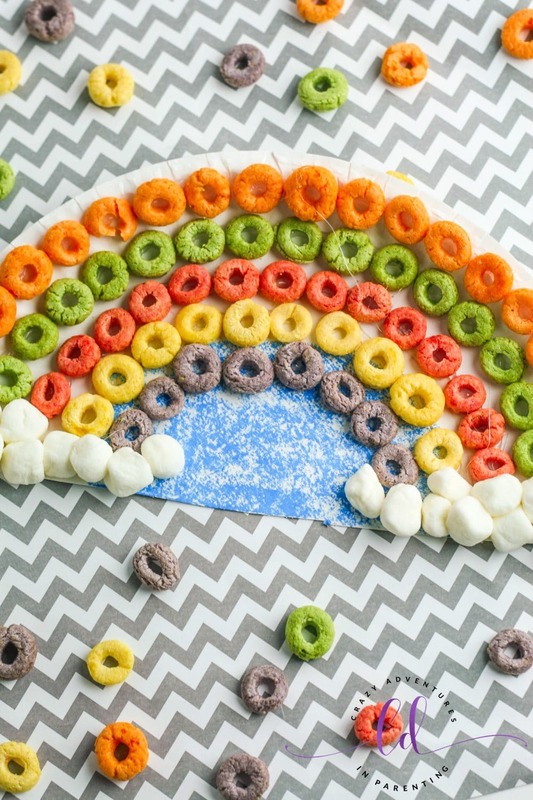 For real, it’s fun to snack on the food you’re using for the craft, and this Cereal Rainbow Craft is no exception! Do you recall the macaroni necklaces and cereal necklaces when we were kids? This is just like that! Except, y’know, since there’s glue on this, you can’t eat it afterward, haha. But you CAN snack while you create with the spare cereal! We used a store brand version of Froot Loops for this craft (didn’t want to use the good stuff, haha) but you don’t have to use circular fruity cereal for this if you don’t want to! You can use Fruity Pebbles or whatever’s available so long as it has multiple colors! This is a good craft for kids of all ages! It teaches colors and sorting to the littles while it gives the older kids the ability to really create and make this craft their own! 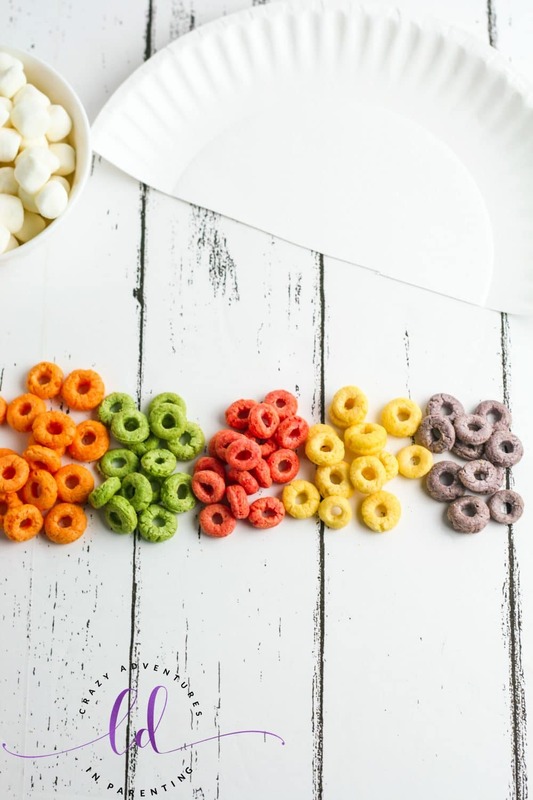 We did a very simple and basic rainbow craft here to show you the basics on how to create this Cereal Rainbow Craft but your kids can turn this into their own! With this craft, your children can count out the cereal colors in each pile, and again as the cereal is glued to the craft. Yay for learning crafts like this, am I right? This craft not only helps with sorting and grouping, with colors, but also math? Talk about winning! Woohoo! Plus, with littler children, they’re working on their dexterity to keep the colors in a line, put the glued cereal in place, while using the crayon to color, etc. This fun and coloring Cereal Rainbow Craft is a fun one to make for St. Patrick’s Day, Spring, birthday parties, or any other occasion! This is a fun craft for kids that’s great for children of all ages to make! We love creating art with our children in all kinds of ways, crafts included! You know, I made similar rainbow crafts just like this when I was little. How fun is it to relive those memories from the past and remake them with your children! It means a great deal to me to share things like this with them, you know? Things I once did with my mother, friends, teachers, and classmates. Gather all your items – be sure to have a bowls ready for the cereal and marshmallows to make it easy to grab, but have spare ingredients nearby in case you need more for each craft. Cut your paper plates in half to make a demi-circle. Using the blue crayon, color the bottom half of the paper plate blue as shown. As you add your colors, have your child count how many pieces of cereal they placed. As you add your addtional rows, it will require less cereal each time. Consider it to be a “science experiment” to see how many each color had as you add your second row, placing it similarly to the first, but in a different color. Add your fourth row of colored cereal. Add your fifth row, which might be your last depending upon the cereal your purchased and how many colors you have separated. In addition to being potentially the last row, this or the next row also might overlap the blue sky, and that’s alright! When all colors of the cereal have been glued successfully onto the paper plate, glue the mini marshmallows at each end of each row to become clouds. You can double stack them to make them “poofy” but you don’t have to if you don’t want. Let the kids have fun gluing the clouds! Let your craft fully dry before your child handles it! You can poke a hole at the top to display it, glue magnets to the back to have it on the fridge, tack it on the wall, or whatever your heart desires! What do you think of this Cereal Rainbow Craft? Do you think your kids will love making it with you? Check out our other crafts and printables (including coloring pages) while you’re here! Be on the lookout for Rainbow Cupcakes coming soon! And please come back and let me know what you thought of our craft! I’d love to see pictures of your children’s creations! Gather your ingredients and place them into separate bowls keeping some spare ingredients nearby in case. Cut each paper plate in half to form a semi-circle. Using a blue crayon, have your child color the bottom half of the paper plate blue to represent the sky. Starting at the outer edge, glue the first color of cereal along the outside arc of the plate, using a different color for each row. Be sure to leave space at the bottom for the marshmallow clouds. When all colors have been glued in their individual rows, glue the mini marshmallows at each end as clouds. You can double stack and make them into any shape cloud you’d like! Let the craft dry fully before your child handles it. You can poke a hole at the top and string yarn through it to display it, glue magnets to the back to have it on the fridge, tack it on the wall, or whatever your heart desires!